You wouldn't normally expect the horror and puzzle genres to go together, but Slayaway Camp: Butcher's Cut makes it feel like the two are peanut butter and chocolate. It feels like it's meant to be. The first run of puzzles in this horrific slasher game is fun, hilarious, and gruesome in equal measure. Does this concept carry through an entire game, or does this slasher get what's coming to them a little too early? The premise of Slayaway Camp: Butcher's Cut, is that you're the killer in a classic slasher film. Your goal in every level is to eliminate the targets and get out without getting shot, burned up, or meeting any other type of demise. It starts with a classic masked killer, followed by expansions, spinoffs, and entirely new franchises as you progress. Each "film" is a set of levels that are played back-to-back. As you progress, you'll unlock new killers, new kill moves, new abilities, and new hazards as well. The game's puzzles start out simple enough, but it doesn't take long before challenge sets in. Modifiers come into play every few levels, where you must find the solution in a certain number of moves, or you'll be swarmed by police forces. There are short intros for each movie that have a healthy dose of classic horror movie cheese to them, offering hilarious parodies of the endless parade of sequels back then. The game dedicates itself to this sense of style and it's all the better for it. From the VHS video store menu to the horrifically brutal killing scenes, the game is unapologetic and fiercely loyal to its inspiration. 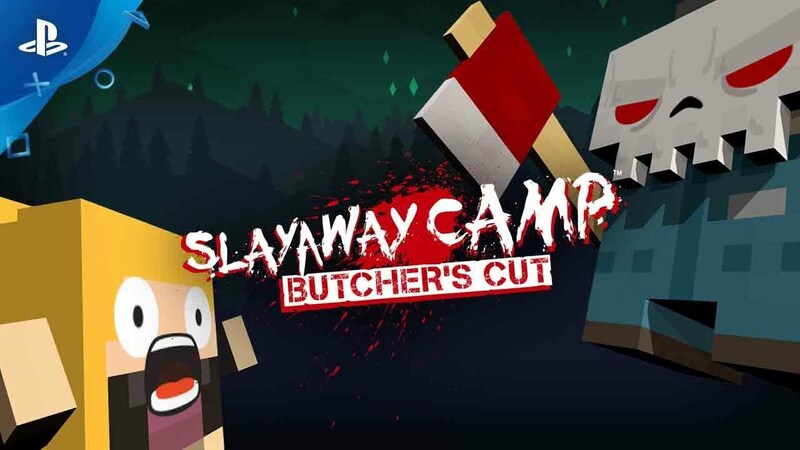 As a big horror fan and a lover of classic slashers, Slayaway Camp: Butcher's Cut perfectly encapsulates this genre in a fun horror parody that really worked for me. Let's see if the gameplay and the puzzles are enough to carry the great sense of style the game has. Your character can move in the four cardinal directions, and that's it. You'll slide across the level until you hit something or someone, so there's no tip-toeing around these puzzles. Colliding with a helpless teenager will trigger a kill sequence, and killing all of them will open up the level's exit. As the game goes on, you'll be able to trigger environmental events to assist you, but new hazards will appear as well. Fire, deep water, holes in the ground, and cops just to name a few. If you stop in the sights of a cop, you'll be shot on sight, and the other hazards will end your killing streak when you slide into them as well. Certain levels will also put you on a timer, or dictate that you must finish it in a certain number of moves. These are especially difficult, as you must ascertain the perfect combination of moves to kill every target and escape. Small mini-games between levels test your reflexes and offer bonus coins as well. Your currency can be used to buy new characters, new killing moves, and other unlockables, giving you something to spend your hard-earned cash on. The simple concept means that anyone can jump in and have fun. You won't need to know much beyond the movement controls, making this a fun puzzler that any level of player can enjoy, assuming they don't mind the gruesome kills. The game does a good job of introducing new concepts as you go on, but the elephant in the room here is, of course, repetition. While Slayaway Camp: Butcher's Cut does a great job of keeping this feeling at bay, there's no denying that marathoning levels start to grate on you after a while. Even so, the quick, bite-sized levels make it easy to jump in and out of the game. While I can't deny that things started to get repetitive after several in-game "films" worth of levels, I really enjoyed the smart puzzle design, the hilarious kill animations, and the overall style of the game a lot. The presentation in Slayaway Camp: Butcher's Cut is one of my favorite aspects of the game. The 80's horror aesthetic is incredibly well done and the level of dedication to the genre is admirable. Clever parodies will easily draw parallels to your favorite slasher films, while other hilarious ideas will call to mind some of the worst B-horror movies you've come across. The block-style graphics offer just enough detail to get the point across, while still being a ways off from uncomfortable gore. Thanks to this, the kill animations come across as funny and cheesy, as opposed to shocking and unsettling. The synth-filled 80's soundtrack is also excellent, tying a perfect bow on the aesthetics and style. If you happen to be a fan of both horror and puzzle games, Slayaway Camp: Butcher's Cut offers a lot of nostalgic fun at a great price.